The Danone Nations Cup is the world’s biggest football tournament for children between the ages of 10 and 12, (U12s category), organized by Danone since 2000. The Danone Institute International has been for some years a partner of the Danone Nations Cup and developped dedicated education tools on healthy eatings and physical activities for the children. To overcome language and cultural differences among children of 32 nations, focus is made on taste education, mealtime conviviality and basic nutrition. Through the use of interactive educational cards, children can be lead into discussions around the origin of several every-day foods. This program includes cards which represent the three stages of a food before arriving on the plate: where it grows, the whole food it comes from, and the finished food we eat. Taste stimulation is an extremely important part of early childhood development. Exposing children to different tastes, as children will increase their preference for a wide variety of foods. The objective of this activity is to use yogurt to create a fun activity for children that will stimulate their curiosity around food. The Nutrigame is an educational game that teaches children about food groups and the food pyramid and challenges them with physical endurance. The Nutrigame is best run with 20 to 30 Children on two different teams. 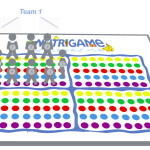 It is a collaborative team game that takes place on a giant mat with several different coloured circles. The intercultural food pyramid was developed for the Danone Nations Cup nutrition activities although it can be used as a stand-alone educational tool for display in schools, community centres or in the home. It can be displayed along with the ‘My Meal’ poster. This pyramid was designed to include the notions of food pleasure and conviviality and to include foods from a variety of different cultures. The water bar invites children to explore taste through the use of water. The objective is to teach the children how to differentiate tastes and discover the fundamental flavours through a hands-on activity. The waterbar is designed to encourage children to discover the pleasure of plain or naturally-flavoured water. This activity includes material for three tasting stations. 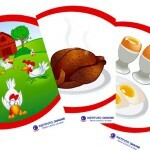 Posters are provided as visual aids and to facilitate children’s learning.